Something wakes you up out of a deep slumber. Did someone’s dog get sprayed by a skunk last night? What is that putrid stench? No, it’s just your little cat licking your face trying to wake you up as per usual. Wait – why on earth does his breath smell so bad? And how can you fix it as soon as possible? The truth is, cat bad breath can be a sign of something much more sinister. This isn’t always the case, but it’s possible. That’s why it’s so important to understand why your cat’s breath stinks and how to make it stop when there aren’t any underlying health issues to worry about. What Does It Mean When a Cat’s Breath Stinks? What If Your Cat Has Bad Breath and Weight Loss... or Other Symptoms? When you wake up in the morning, your breath generally doesn’t smell sparkling fresh, does it? So, why would your cat’s? Using this logic, you might jump to the conclusion that your cat’s teeth should be rotting out of his head. However, cats have a very different diet than humans. Well, they should at least – as long as you aren’t feeding your cat candy and sweets. What does it mean when a cat’s breath stinks? Nothing really. It’s true that your cat’s breath shouldn’t smell like a summer breeze, but it shouldn’t smell like death either. Chronic halitosis in cats or an overwhelmingly bad smell could indicate there’s a serious problem going on. The same factors that cause halitosis in humans lead to cat bad breath: tooth decay and bacteria. Bacteria accumulates in the mouth’s soft tissue and teeth. Over time, these bacteria lead to gum disease, periodontal disease, and chronic halitosis. 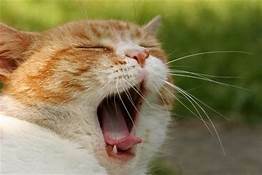 And, just like humans, bad breath in cats can be a sign of a dangerous underlying condition like liver or kidney problems. If you notice bad breath in your cat, just take him to the vet first and foremost. Although there’s a good chance nothing serious is going on, your cat’s teeth might need a good cleaning. From there, you can employ some of the remedies below to keep your little one’s teeth clean and stench-free. Let’s say you’ve already went to the vet and your cat’s teeth look fine. Unfortunately, it also means you now need to tackle cat bad breath all on your own. It’s okay – you have a few different remedies to choose from. You’ll need to try a few different things out to see what works for your cat. Just like halitosis in humans, the cause isn’t always the same. Try one remedy at a time so you can A/B test different methods. If you can’t find a singular remedy that works on its own, then start adding additional techniques to the mix. Your poor cat might just be cursed with persistent halitosis – just like your old uncle Larry. Unlike your uncle Larry, however, you can continue different methods through trial and error to find some relief for your cat (and yourself). Here's why visiting the vet is so important: he or she can recommend a water additive to use. 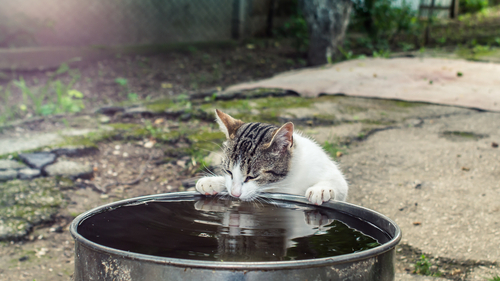 You cannot under any circumstances put a water additive made for humans into your cat’s water – this can be dangerous. Your vet can look over your cat’s medical history and recommend an appropriate additive. These additives can be very effective when used correctly because they contain special ingredients to get rid of bacteria and plaque on your kitty’s tiny teeth. Think of it like a mouthwash you drink. Well, a mouthwash your cat drinks. 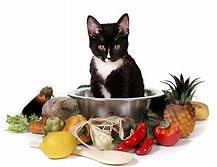 Stick with the flavorless and odorless varieties so your cat won’t get sick of it or avoid his water dish entirely. There’s a whole industry full of treats specially designed for fighting cat bad breath. Just take a walk down the pet aisle and you’ll see for yourself. Grab a few different brands to see which works best. The Veterinary Oral Health Council has a list of approved products for cats which they frequently update with new products. For treats, the VOHC recommends Feline Greenies, Purina Pro Plan Dental Crunch Cat Snacks, and Purina DentaLife Daily Oral Care Cat Treats. Yes, brushing your cat’s teeth is about as fun as it sounds. She certainly isn’t going to like it – but it’s worth a try if your cat really needs her teeth cleaned. Start out slow by touching your cat’s teeth and lips. Next, get her used to the feel of a brush in her mouth. From there, you can move onto full-blown teeth brushing. 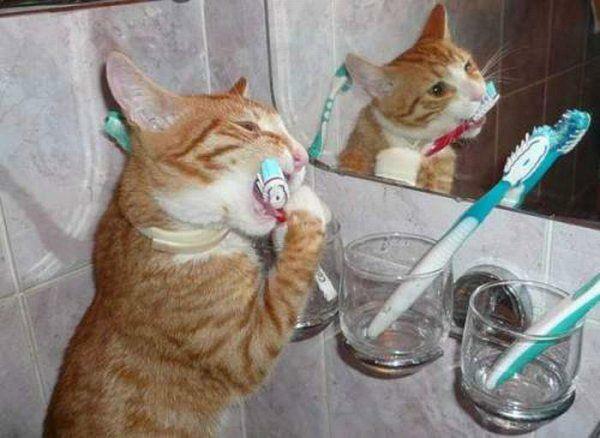 Always use vet-approved cat-friendly toothpaste. Human toothpaste can quickly become toxic to cats because they won’t spit it out like humans know to do. Check with your vet about using an appropriate toothpaste for your cat. When you think of chew toys, you probably think of dogs rather than cats, but some cats enjoy a good chew session. If your cat is one of them, grab her some cat-friendly chew toys to help clean her teeth. As a bonus, this will prevent your cat from chewing on wires, shoes, plastic, or anything else she loves to gnaw. Some toys come in flavors while others provide a cat nip scent to entice your cat to chew. 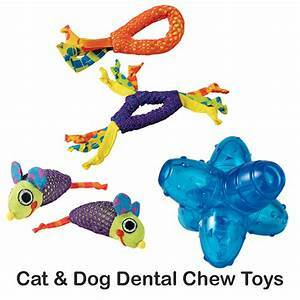 Check with your vet about chew toys that could potentially pose a choking hazard or damage your cat’s teeth. There’s a chance your little guy’s diet might be behind his putrid cat bad breath. If you typically feed your cat a lot of wet food, consider including some dry kibble into his diet. Raw food diets might be better for your cat’s overall health, but they could also lead to some pretty stinky breath. The VOHC has a list of foods they recommend to fight tooth decay and oral bacteria such as ScienceDiet Oral Care for Cats and Purina Pro Plan Veterinary Diets (PPPVD). Always make sure your cat is receiving enough animal protein and staying hydrated with adequate water. 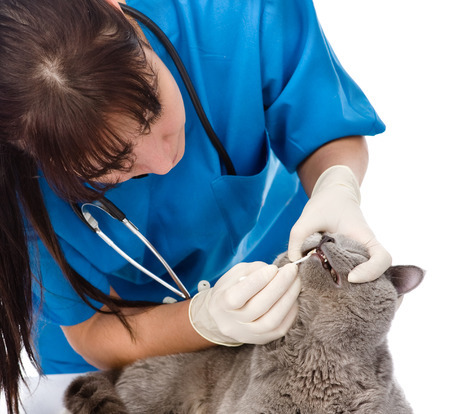 A quick look at your cat’s teeth will let the vet know whether or not your little guy could benefit from a thorough cleaning. 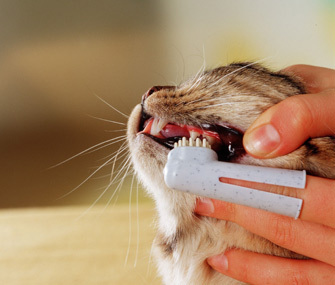 Teeth cleanings for cats are very similar to those for humans. The only difference is that your cat will need to be put to sleep -- can you imagine scraping a cat’s teeth without anesthesia? Not gonna happen. After the vet has cleaned your cat’s teeth, you can implement some of the other remedies on this list to keep his cat bad breath at bay. Bad breath happens to the best of us – even cats. In most cases, it doesn’t mean anything dangerous is lurking. In other cases, however, your cat could need serious medical attention. Discolored or inflamed gums: Your cat’s gums are like a window to their overall health – they should be slightly pink. When pressed, the gums should turn white for a second or two before returning to pink. Anything white, yellow, blue, red, or inflamed is cause for concern. 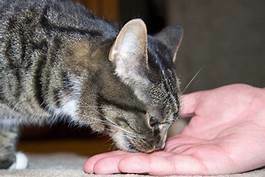 Thirst and frequent urination: If your cat’s breath smells more strange (fruity and sweet) than bad, it could suggest they’re suffering from diabetes. Look for accompanying symptoms like chronic thirst and frequent urination. Yellow eyes: Jaundice with bad breath (or jaundice at all) could mean that your cat is suffering from liver problems. Drooling: This could mean your cat is in a good deal of pain from gum disease or an oral cancer. Weight loss: If your cat’s breath smells like urine and has lost some weight, this might suggest an underlying kidney problem. Look for other symptoms like frequent urination as well. If your cat is experiencing any of these symptoms or any behavioral changes, see a vet immediately. After you’ve got your cat’s bad breath under control you’ll need to take some preventative measures to maintain good oral health in the future. 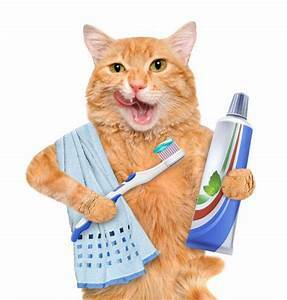 Clean teeth are an important part of good health in humans and this is no different in cats and as always: prevention is the best form of medicine. Talk to your vet about changing your cat’s long-term diet for oral health. Look for a vet that specializes in some kind of dentistry. They’ll know what to look for and how to help. Incorporate dental-friendly treats into their daily routine. You can implement most of the same remedies for removing bacteria and plaque to keep your cat’s teeth in good shape. Remember to conduct regular at-home exams to monitor your little one’s gums and teeth health. When in doubt, always see or call a vet.